I went to a local store to pickup a CM Storm keyboard with Brown switches. They didn’t carry the older QuickFire Rapid model. They did stock the newer QuickFire Stealth model, which is largely the same keyboard with minor cosmetic differences, so I purchased a Stealth keyboard with Brown switches. As you can see from the following picture, the structural design of the two keyboards is very similar. Some gamers rave about the tactile bumps in the Brown switches. Theoretically, tactile bumps sound like a great idea, since they provide feedback when a key is pressed. However, I believe there’s a fundamental design flaw in the Cherry MX switches: there is too much total travel distance in the switch relative to the actuation point, which is where the keystroke is registered. The switch registers the keystroke partway into the keypress, and the remaining keypress travel is functionally pointless since nothing happens aside from bottoming out. According to Cherry Corp., their MX switches register a keystroke at 2mm, then bottom out after another 2mm, but it feels like the switch registers earlier than the halfway point in the keypress. Actuation point shown for a Cherry MX switch. Note that the tactile bump is placed before the actuation point. This image is of the Stealth keyboard with Brown switches, but AFAIK the actuation point is the same across switch colors. There is a critical implication here, because the tactile bump for a Brown switch is placed before the actuation point, which means the bump happens even before you’ve pressed the key halfway. Moreover, it takes a low amount of force to push past the tactile bump and the bump is very subtle. I spent several days trying to lighten and shorten my keypressing to adjust to the tactile bump of Brown switches, but even after practicing, I consistently pressed keys well past the tactile bump. If the tactile bump were more noticeable and if the actuation point and the tactile bump were further into the keypress, I think Brown switches would work much better. One complaint I’ve read about Red switches is that they activate too easily, given that they have no bump and low actuation force, and this leads to false keystrokes. After testing both Brown switches and Red switches extensively, by playing the same games and typing the same copy over and over, for me this was not an issue. My conclusion: the tactile bump in the Brown switches didn’t provide meaningful value, due to its early placement in the keypress and how subtle the bump is. I prefer Red switches over Brown as they provide a much more fluid feel. 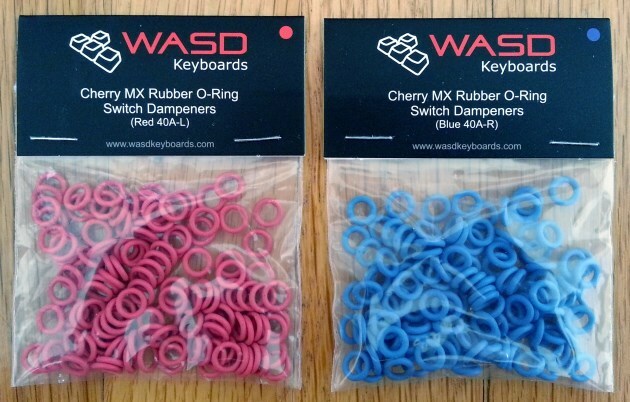 WASD Keyboards was kind enough to send me two sets of O-rings to test with. In a nutshell, the Blue O-rings are thicker than the Red ones (0.4mm vs 0.2mm). It was trivial installing the O-rings. Each O-ring has a natural tendency to roll one way or the other, so you want to keep that in mind when rolling an O-ring onto a key. Keys fully depressed, with and without O-rings. That is, the image shows keys pressed until they bottom out. If you look at the right-most panel, you can see that the travel distance with a Blue O-ring is slightly shorter than a Red O-ring, which is what we’d expect given that Red O-rings reduce travel by 0.2mm and Blue O-rings reduce travel by 0.4mm. So which O-ring color is better? Some gamers say that the Blue O-rings ruin the feel of the keypress, especially for Brown switches. I disagree. As I mentioned earlier, the actuation point for Cherry MX switches is halfway into the keypress – regardless of switch color – so you have lots of meaningless travel until the key bottoms out. By installing an O-ring, you reduce that wasteful travel distance. In the case of Brown switches, the tactile bump occurs before the actuation point and therefore well ahead of bottoming out even with Blue O-rings. My conclusion: Cherry MX switches work meaningfully better with O-rings, and Blue O-rings provide more cushion and reduce more wasteful travel as compared to Red O-rings. I kept the keyboard with Red switches (CM Storm QuickFire Rapid keyboard) and Blue O-rings (manufactured by WASD Keyboards). Almost half a year has passed, and this setup has worked extremely well for gaming and typing. My fingers don’t get fatigued, the noise level is acceptable, and the keys feel very responsive. It was definitely worthwhile to do the hands-on testing, because if I had simply listened to what others had written, I’d have made the wrong selection of colors for both the Cherry MX switches and the O-rings. From the reviews and forums I’ve read, the CM Storm QuickFire keyboard is the best-value mechanical Cherry MX keyboard on the market, especially with a price point of under $100 USD. I highly recommend it based on my experience. If you’ve tested different switch colors and different O-ring colors, I’d love to hear your take on them. UPDATE (2015/01/04): based on this thread in the MechanicalKeyboards sub-Reddit, it looks like I’m not alone in the opinion that Brown switches are overrated. The only personal experience I have with Cherry MX is Red, without O-rings. The issue I ran into was that the button presses were so deep, yet they triggered after barely touching them. At least that’s how it felt. And the keyboard was really noisy. I require silent keyboards. If I would get a new keyboard for all purposes, I’d take a Cherry MX Red with Blue O-rings, based on your review. As I mentioned in the old post, I have a gamepad for gaming, and a tiny silent keyboard for typing. Still love the setup, though gamepad could be somewhat improved. Found some insightful comments over on geekhack. As many have observed, browns seem like “dirty reds”. I have now tried all the major Cherry mx switch types (blue, green, brown, clear, red, black). To me, blues felt like typing on rice crispies, greens were just heavier blues, browns and clears felts like someone had put sand in the works, and reds and blacks were devoid of any tactile or aural feedback. Of all these, I liked reds the best; I could use bottoming out as feedback. Blacks were also okay, but a bit too heavy. The thing is, all Cherry switches are inherently linear. Those with feedback simply have a bump grafted onto the stem. If I were to use Cherry mx, I would prefer them without an artificial bump. I’d go for either reds or maybe vintage blacks. Nevertheless, browns are rather popular, perhaps because they provide some degree of tactile feedback without an annoying high-pitched click. Thus, they are a happy medium between reds and blues; an okay all-purpose switch. Personally, after trying all the major Cherry switches except MX White (red, blue, brown, black, green, clear), I don’t find browns terribly disappointing, but I would much rather use blues, greens or clears. I do feel that the tactile action of brown switches can provide useful feedback, although the small bump reduces the usefulness of this feedback in relation to MX clears for example. 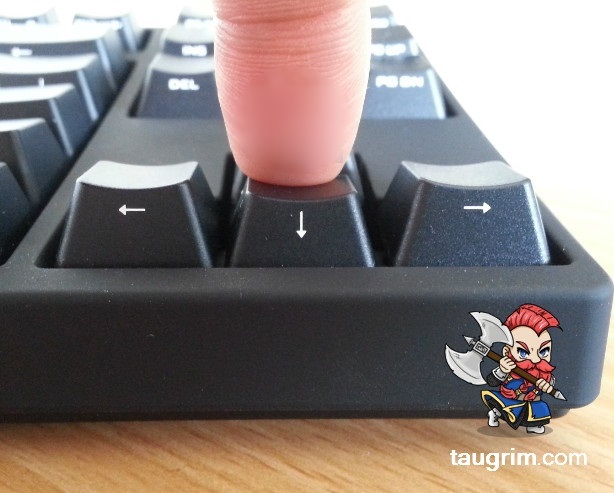 As someone who tends to float keys while gaming, I find the tactile bump to be very useful, as they give me a firm indicator of where I am in my stroke in relation to the actuation point. In terms of distance to actuation and bottom out, all stock MX switches should have the same characteristics (2mm actuation, 4mm bottom out). With tactile switches, the tactile bump comes just before the actuation point — once you pass the tactile bump, actuation occurs very quickly. MX browns have a tactile area between 1mm and 2mm depression, with actuation at 2mm depression. I feel that the value of brown switches is as a starting point. They’re a decent middle ground, which allows people to determine in what direction the would like to move for future boards (i.e. do you want a board that’s more/less tactile, would you want audible feedback, would you want a heavier switch, etc). However many people are also happy with brown switches all on their own, and never feel the need to try and get something different. in side by side comparisons brown always seems to lose because every switch does something better than browns. this causes most enthusiasts to dislike the switch. it is also one of the more popular switches for beginners because its not to heavy, not to light, tactile but no click etc. then like a rebellious teen they rail against the safety of their home that sheltered them in their younger days as a doe eyed keyboard enthusiast. they think “moving on” from browns is a sign that the switch is bad and not just that they were perhaps picking a switch that was not for them. and even those who ‘like’ what browns have to offer, topre is very close to browns in alot of ways, but they are much more smooth which is what many people think is wrong with browns. It’s interesting to read how the “enthusiasts” view different switch colors as opposed to “casuals”. Many of the enthusiasts over at geekhack have owned multiple mechanical keyboards, tried different switches, etc. From a practical standpoint, I don’t see myself buying another mechanical keyboard until this one breaks. I’ve been very happy with it. I took a leap of faith on these, but they seem to have done a fine job. That long travel is dealt with by the O-rings. Most people get them for the noise (with my blue switches, I got them because I wanted to hear the blue click without as much clack) but they do reduce the travel, which if that is what you’re after, is pretty nice, although a little weird with blues. I just got a new board with reds, and I think I like them without the O-rings, but if the long travel is an issue to you, you should definitely try it. You are completely correct about the actuation point. Cherry switches actuate near the top of their travel, and after that, it’s all just wasted energy. Blues are strange in that they actuate at about the same point as reds, but they release a little bit higher, if that makes any sense. Reds don’t have that issue; they actuate and release at the same point. Anyway, I bought a pack of 100 generic o-rings from Amazon, because I felt like $2.50 was far preferable to $18 for some small pieces of rubber, but if you’re not sure of the inner diameter and thickness you need (can’t remember off the top of my head) then just pay $10-$20 for the brand name ones. It’s a worthwhile mod, and you won’t be out much if you end up not liking the change. That last part is pretty much why I went with the O-rings designed for gaming keyboards. I tried dropping by a hardware store to see what they had, but I wasn’t sure whether their rings were as suited as the gaming ones. I spend soooo much time on my keyboard that I wanted to get it right. Understood re: the button presses being so deep – that’s an issue for any Cherry MX switch color. Reds have the lowest actuation force of any Cherry MX switch color, so they’re not for everyone. I like the low actuation force of Reds – I can expend minimal energy typing quickly for gaming. That said, from reading the geekhack forum, it sounds like mechanical keyboard aficionados as a whole tend to prefer switches with higher actuation force. Although I’m not clear whether they’re talking from a typing perspective or gaming perspective. And the keyboard was really noisy. I require silent keyboards. The non-linear switch colors (i.e. anything other than Red, Black, etc) are much noisier. Browns are noticeably louder than Reds, and Blues are much noisier than Browns. I’d likely try Blue O-rings with any switch color, to address the issue with the button presses being so deep. If you want a quiet keyboard but desire switches to require more force, Black switches may be a better fit for you. Your review of the CM Storm QuickFire Rapid Tenkeyless Mechanical Gaming Keyboard (https://taugrim.com/2014/07/20/review-cm-storm-quickfire-rapid-tenkeyless-mechanical-gaming-keyboard/) and the article you linked to regarding the different types of Cherry MX switches (http://www.furiouspaul.com/articles/cherry-mx-keyboard-switches.html) made me interested, and I learned a lot from it. However, based on your comments in this thread and the overview I found at the Geekhack wiki (http://wiki.geekhack.org/index.php?title=Cherry_MX), I now really want a keyboard with black switches, and probably blue O-rings. Now the issue becomes to find a great compact, tenkeyless and comfortable keyboard. 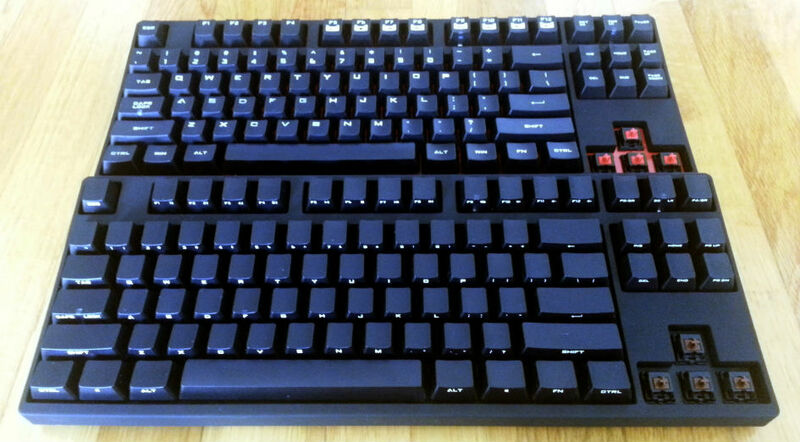 Sadly, there is no version of the CM Storm QuickFire Rapid Tenkeyless Mechanical Gaming Keyboard with black switches. Alas, the hunt for the perfect keyboard goes on. Sadly, there is no version of the CM Storm QuickFire Rapid Tenkeyless Mechanical Gaming Keyboard with black switches. That said, after Googling a bit, it looks like that particular model is hard to find or sold out on most online stores. Sounds like you have 2 keyboards? If yes, which ones do you use? Does the brand or keyboard matter if the switches are the same? I might pick your keyboard up if they are. I’m currently interested in the Corsair K70, but price is also a concern. Also, have you ever tried stacking o-rings before? Cherry MX keys have too much extra height, so I was wondering whether it was possible to keep reducing the height until it becomes a total tap. I am interested in the Reds, if it is true that they are basically the exact same as the Browns subtract the bump. Does the brand or keyboard matter if the switches are the same? Cherry is a brand of switches, so if you get Cherry switches in different keyboards, they’re still the same switches. And then there are different brands for keyboards – e.g. CoolerMaster, Filco, Ducky, etc. Based on my research, CM keyboards are popular because they are at a reasonable price point and work well, i.e. they’re a good value. I have not, nor have I heard of anyone doing so. It’s an interesting idea though, given how much the switches travel. The Browns have slightly higher actuation force, so you have to press the keys a bit harder to move them. If you have a good computer store near you, it’s worth checking out the keyboards in person. Here in the SF Bay Area we have Fry’s Electronics, so I got to at least take a look at several brands, including CM, Corsair, and Razer. 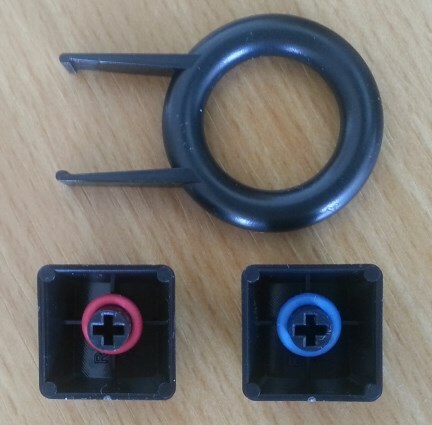 I have started selling Rubber O-rings for Mechanical keyboards with Cherry Mx compatible Switches. These rubber O-rings have the ultimate profile for dampening noise produced by your mechanical keyboards.